By John C. Toman. Posted September 11, 2011, 11:52 AM. An unusual round of upper level subtropical moisture drawn into Southern California by low pressure resulted in rainfall in the northern areas, and also in Orange County, even while low clouds and fog sat in the lower layers of the atmosphere. 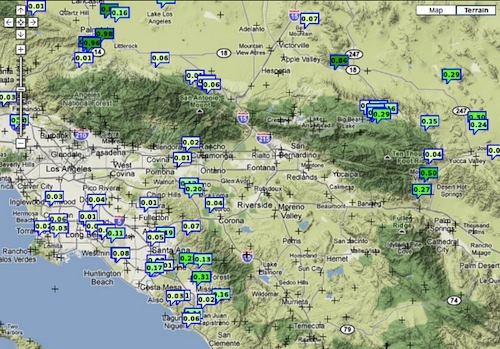 Rain landed mainly in Orange County and the lower Los Angeles basin Saturday morning, and covered an band from San Clemente up to Yorba Linda, 0.04" in Corona, and even up to Pomona. The moisture didn't come far enough south for any showers or thunderstorms over the inland valleys in Riverside, San Bernardino and San Diego counties.